A beautiful combination hunting and working ranch with over 2 miles of limestone bottom School Creek along high rock bluffs. Two concrete dam sites on the creek back up long pools of water for year-round enjoyment. A rare offering, the ranch has been owned by the same family for over 50 years and operated as a traditional livestock ranch. The property provides the new owner a great investment opportunity in the Northern Hill Country with the ability to be a combination recreation and livestock ranch. The upland portion of the property is densely covered with Live Oak, Spanish Oak, Elm, Cedar and Mesquite scattered across several deep draws offering excellent wildlife habitat. The lower areas along the creek are comprised of very fertile soil for outstanding food plot possibilities and improved grass pastures for grazing. Towering Live Oaks, Elm and Pecan trees line the banks of School Creek making an idyllic setting. 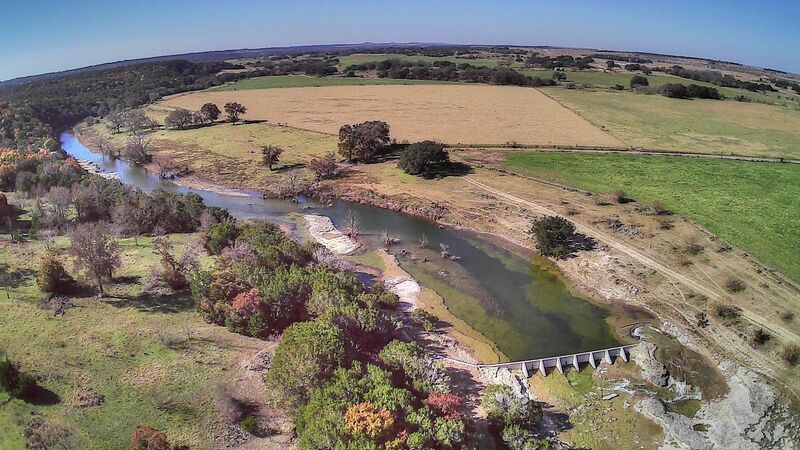 This property is a prime candidate for conversion to a game ranch with the varying terrain, fertile bottom land, abundant water and great location. Access: Over two miles of frontage on FM 1690 with multiple access points. Water: Over 2 miles of School Creek traverse the property with two concrete dams that back up water for long distances and year round enjoyment. In addition there are several stock tanks and four water wells. Improvements: Main House, three bedroom and two bath of brick construction overlooking beautiful, fertile bottomland along the creek. The ranch foreman’s house constructed of cut limestone, ranch hands house of frame construction and an old frame hunters house close to the creek. Several barns, a workshop and two large grain storage bins. An excellent set of pipe cattle working pens are located at the ranch headquarters. Flora: The lower elevations along the creek bottom are dotted with large, mature native Pecan, Elm and Live Oak Trees. The rising elevations North of School Creek have been cleared of the invasive cedar and mesquite allowing the Live Oaks and native grasses to flourish. There is approximately 250 acres in cultivation along with 200 acres of Coastal Bermuda Grass. The balance of ranch is upper elevations comprised of shallow soils, caliche ridges with scattered Live Oak, Spanish Oak, Elm, Cedar and some Mesquite. Fauna: Due to the permanent water in School Creek, there is an abundance of wildlife including Whitetail Deer, Wild Turkey, Quail, Feral Hog and a variety of Varmints. It is not unusual to find Ducks on the ponds and creek during season and the Dove shooting along the Creekside fields can be outstanding.